SHARM EL-SHEIKH, Egypt (Reuters) - U.S. Secretary of State John Kerry on Friday urged businesses to invest in Egypt and praised President Abdel Fattah el-Sisi's government for reforms to restore investor confidence and boost the economy. Addressing an investment conference in the Red Sea resort of Sharm El-Sheikh, Kerry said the United States would support Egypt's economic progress "in any way we can" to ensure lasting growth and to attract needed investment. He cautioned, however, that greater prosperity should be shared among all Egyptians and not just a few. 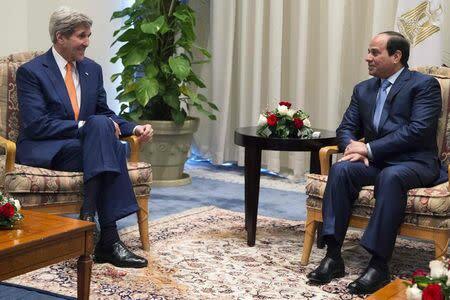 "We will work with you to secure ambitious goals you have laid out," Kerry told Sisi. "There is no question that the emergence of a strong, prosperous and democratic Egypt is critical for a strong and prosperous region." Egypt hopes the three-day conference will help boost investment in an economy still recovering from years of turmoil after a 2011 uprising toppled veteran leader Hosni Mubarak. Investment Minister Ashraf Salman told Reuters he expected Egypt to clinch deals at the summit worth $15-20 billion. Earlier on Friday, Kerry met with Sisi before being joined by Jordan's King Abdullah and Palestinian leader Mahmoud Abbas to discuss regional challenges. At the conference plenary session, Kerry shared the front row with heads of state and ministers from across the Middle East and North Africa, who each pledged support for Egypt and its transformation. Among them was Sudan's President Omar al-Bashir, who Washington accuses of human rights violations and is wanted on charges of genocide by the International Criminal Court. The United States is among Egypt's top three trade partners and U.S. firms are the second-largest source of foreign direct investment (FDI). FDI flows declined after 2009 but are picking up, says the International Monetary Fund, which has put FDI over the past three years at just 1.5 percent of Egypt's GDP. 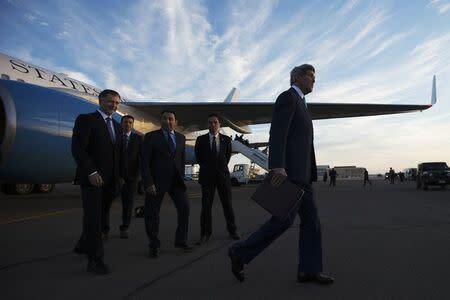 In his meeting with Sisi, Kerry was likely to discuss security in neighboring Libya and in Egypt's Sinai region and the growing threat from Islamic State militants, a U.S. official said. Islamic State's Egypt wing has claimed responsibility for attacks in the Sinai Peninsula that killed more than 30 members of the security forces in January. 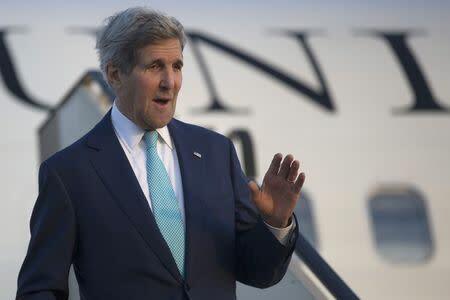 Kerry did not pledge military assistance to Egypt despite Sisi's calls for such aid. A senior State Department official said the U.S. delegation wanted to focus on economic investment. Washington normally sends $1.5 billion in mostly military aid to Egypt each year but suspended transfers in protest over the ousting of Egypt's first democratically elected president, Mohamed Mursi, in 2013 and a violent crackdown on protesters. Last April, Washington said it would deliver 10 Apache attack helicopters to support counter-terrorism operations in Sinai.